3. My mom would make up several rolls at a time and keep them in the second refrigerator on the backporch. The one where we stored all the coke (such as coca cola or a Dr. Pepper coke or an orange coke or a grape coke) and a drawer of earthworms for live bait. Once she had cut a few slices off to bake, I could sneak in and take little slivers without being scolded or shamed for loving them while being “husky.” Because of course it must have been my stubbornness that led me to sneak food and not the fact that I was being pushed to diet WHILE living on massive doses of steroids for my asthma. But the cookies are really good. You should try some, and that means making them yourself, cause the dry crumbly version some diners sell are nothing like the soft fresh originals! Then add 1 cup chopped nuts (we always had hickory nuts, but those are damn hard to find in markets. Try pecans, I guess). Let this mixture cool to room temp. Chill the dough for a couple of hours. Then divide it into 2 even parts. 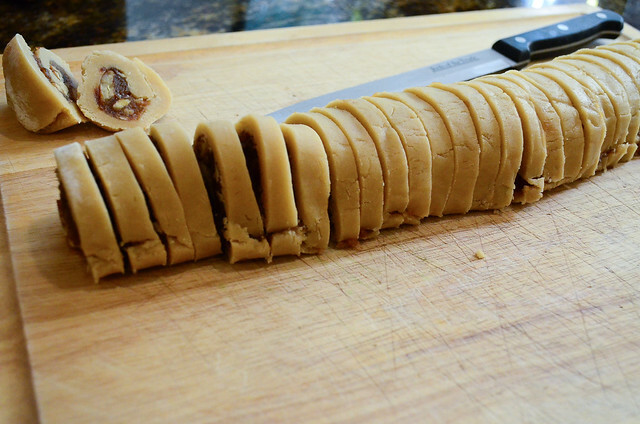 Roll each section out as a rectangle. This will involve adding plenty of extra white flour under the dough, cause it begins to get sticky as soon as it warms up. Thin, but not too thin, maybe a 1/2 or a bit less. Spread cooled filling across the rectangle, then roll it up, beginning with the long side. Pat into shape. Wrap in waxed paper and place on a cookie sheet. When both rolls are done, place them in the fridge and chill. They can stay in the fridge for up to a week, so you can slice off only as many cookies as you want at a time and serve them warm. Cook at 375 (or maybe less, our old oven didn’t always heat consistently) for 10-12 minutes. Or just slice some and eat them raw. The shortening/sugar combo feels so good in the mouth, substantial and a little crunchy and all that fat soothing any rough edges of your cells. 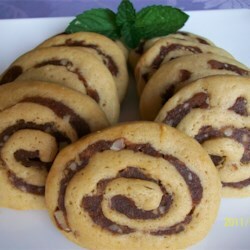 These little crunchy perfections are NOT real date pinwheel cookies. This entry was posted in Uncategorized and tagged Midwestern childhood, strategies for surviving fat shaming, women and food by thisfrenzy. Bookmark the permalink. These are lovely! Thanks for sharing your recipe.